Backyard aviary and bird enthusiasts are always on the hunt for the best accommodations to provide their feathered friends. The wren, with its plain plumage is best known for her spring song, and is often an early arrival in the backyard. Creating the perfect home for these stout warblers may be as easy as brewing up another pot of your favorite java. The house wren or jenny wren, prefers a tight spot in which to roost. A small house with a quarter-sized entry is the perfect starter home for the little, gray birds. Creating a house for these backyard visitors can be good for the environment, as a coffee can, otherwise destined for the trash, can serve as a wren house, either on its own, or as a foundation for a wooden finished product. A 12 ounce coffee can, cleaned and dried, is the perfect size for a wren looking for a new place to call home. The coffee can house will work fine on its own, and if you're a crafty bird lover you can paint the house in a color matching your existing backyard décor. You'll need the can's lid, in which you'll fashion an entryway. Cut a small hole, about the size of a quarter, into the lid. Make sure there are no sharp edges, which may harm the bird, before you put the lid back onto the can. Using large nails, punch two holes into the side of the can spaced about 4 inches apart. This will become the top. You can use cord or decorative chain to attach the coffee can house to the desired tree limb. For a more rustic look, you can use the coffee can as a foundation. For this method, remove the lid and the bottom of the can. Scrap wood, measuring 4 1/2 inches square, can be used to cover each end. One square will need a quarter-size hole to serve as an entryway. Make sure you sand the hole so that the bird can enter and exit unharmed. The roof can be fashioned from 2 pieces of plywood measuring 6 by 9 inches. Shims can be added to give the appearance of shingles. Glue the shims onto the plywood with wood glue, and attach the two squares to the roof pieces using finishing nails. The can should fit inside the squares once they are attached to the roof. A dowel connecting each wooden end will keep the can from slipping out of place, or for easy can removal and nest cleanup, run the dowel through a small hole drilled into each end. The jenny wren isn't a terribly tough customer, and will often be satisfied to steal the nest of another bird. If you're planning to draw other songbirds to your yard, you'll want to space the nests far apart, at least 3 feet above the ground. 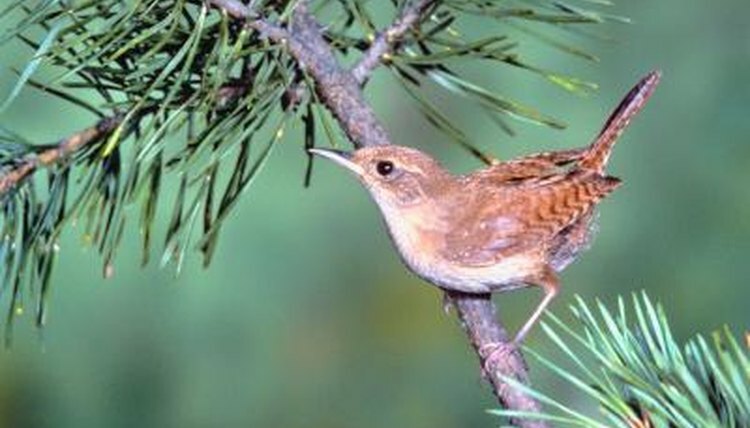 Once your nest is in place, you can add a few small twigs to help your wren get started, but the male is more than capable of gathering everything his growing family will need.